The names of individuals being offered scholarships will be posted on the RCC Foundation website by early May. Do not call the Foundation Office for results. Check your spam folder if your name is listed as a scholarship recipient on the Foundation website, but you did not receive an email notification. For additional assistance, email the Foundation and put your full name and "Notification Question" in the subject line. Students who do not receive an award are generally not notified via email, but are welcome to check the website. Your email notification will give you instructions for accepting your scholarship. This will include writing a thank you to the donor who provided your scholarship. You must complete the online confirmation form by the specified date or your scholarship will be automatically forfeited. If you have questions, send an email to the Foundation. Put your full name and "Scholarship Confirmation Question" in the subject line. Students who are declining an award will be asked to complete a very brief online form. This will allow us to offer your scholarship to another deserving student. Complete your required online scholarship acceptance, which will also include a donor thank you, by the date specified in your Notification Email. If you fail to do this, your scholarship will be forfeited. 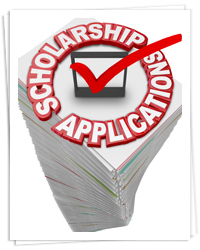 You must meet all of the criteria listed for your scholarship. If no GPA or credit requirements are listed, then the 6 credit per term minimum and 2.50 GPA per term apply, as well as maintaining satisfactory academic progress. Some scholarships require acceptance into specific programs. Failure to meet these requirements can result in the forfeiture of your scholarship. Contact the Foundation Office to update your email and mailing address. We use the information from your scholarship application to communicate with you. The Foundation Office has a separate database and updating your contact information through the college (MyRogue) does not update our records. Scholarship funds will be applied to student accounts in three equal installments (Fall/Winter/Spring). Installments will appear in your MyRogue account near the beginning of each term. Students may request some of their scholarship funds for the Summer term. Students will not receive their scholarship disbursement if there are any holds on their account. Scholarships that are renewable, are available for up to two additional years unless noted differently in the scholarship description. You will need to complete the RCC Foundation Scholarship Renewal form that will be emailed to you in March to be eligible for the renewal each year. You must continue to meet all the scholarship qualifications. Renewals are subject to the funds being available. Payment of any excess balance on your RCC student account is made on or after the end of the second week of each term. If you did not receive your funds, it is possible that you no longer meet the requirements to maintain your award. If you have special circumstances that you would like the Foundation to review, you will need to fill out a Foundation Scholarship Exception Request Form. Students wishing to purchase books should contact the staff in the bookstore for further information.